Information of special interest to undergraduate and graduate students in computing. 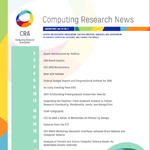 Information of interest to faculty and researchers in computing research. Programs and opportunities for women and minorities in computing research. Click here for all the articles! CRN’s target audience is computing researchers in academia, government, and industry.